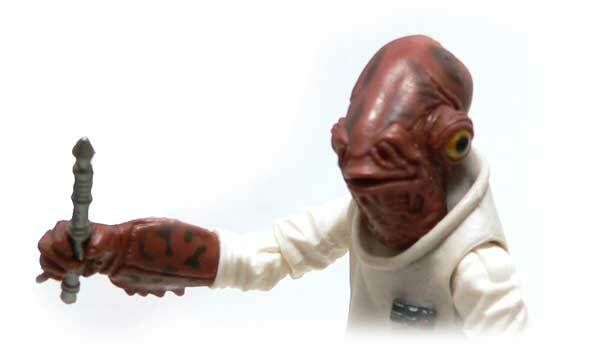 You know in the last few years it seems Admiral Ackbar has been gaining in popularity. I don’t know if it’s people finally are seeing him has a brilliant strategist or Sheldon Cooper’s excellent mimicry. I’m glad for the aquatic admiral. I have to say I’ve always kind of liked Ackbar. He’s one of the few speaking alien rebels in the series, and that’s pretty cool. That all this popularity has got him a new figure is pretty cool. On screen, Ackbar was accomplish in a Muppet like manner. An animatronic head and puppeteer operated type arms. Kind of like the Swedish Chef. The full body shots I’m guessing weren’t the same head as close ups. The figure does a pretty nice job of capturing the Admiral’s likeness. The elongated head and side facing eyes are sculpted fairly well. The little tentacles under his chin are there, just a bit hard to pick out since they sculpted flat to the chin. The thing I really like about his head is the paint. Where the vintage version of Ackbar was executed as a solid red piece of plastic with a little yellow paint for they eyes, this version takes it over the top. It adds the a black wash to parts of the head. This really helps to give this figure the look of the movie character. The one place where the paint is a bit of a let down on the head is the eyes. Instead of bright yellow, this version has a gold iris with black for the pupils. This gold has been used to good effect for Jawa eyes, where it really reflects the light. However, it doesn’t quite pull off the look of big glassy eyeball here. It’s not horrible mind you, just not as nice as it could be. I remember when I was kid I figured Ackbar was an Imperial. He was an Admiral, which was a rank that we had not seen in the Rebel forces. Also, he had a white armor looking uniform with a Stormtrooper like belt. The uniform even had a rank insignia similar to the Empire ones. The uniform here is done well. Lots of folds on the sleeves and middle vest thing is fairly smooth. A neat detail I missed originally, is the yellow stripe continues up the body and is visible in the split in the vest. Another neat paint detail is the soles of his shoes. They are done very well with no slop and clean lines. Both of his claw like hands are sculpted in grasping type poses. While this lets him hold his magic wand, it doesn’t let him point very well. It would have been nice to see one of these in a flatter pose. Speaking of his magic wand, it’s one of two accessories the good admiral is packed with. Basically, it’s just a techy looking pointer. A nice nod to original, I don’t recall if he actually had one of these in the film. I would imagine this could fill in as a lightsaber hilt or sonic screwdriver if you had the need. The other accessory is one I don’t understand. It’s a portion of the console of his chair. Yeah, he uses it in the film, but it’s attached to his chair. It’s not something he’s going to pick up and lug around. This is kind of like making the hyperspace lever of the Millennium Falcon a Lando accessory. Since he does use a chair in the film, it’s nice to know the figure can attain a sitting position due to the split in the vest. The knees are of the swivel and hinge variety so there’s plenty of movement there, as well. There are not, however, ankle joints. I’m okay with that. 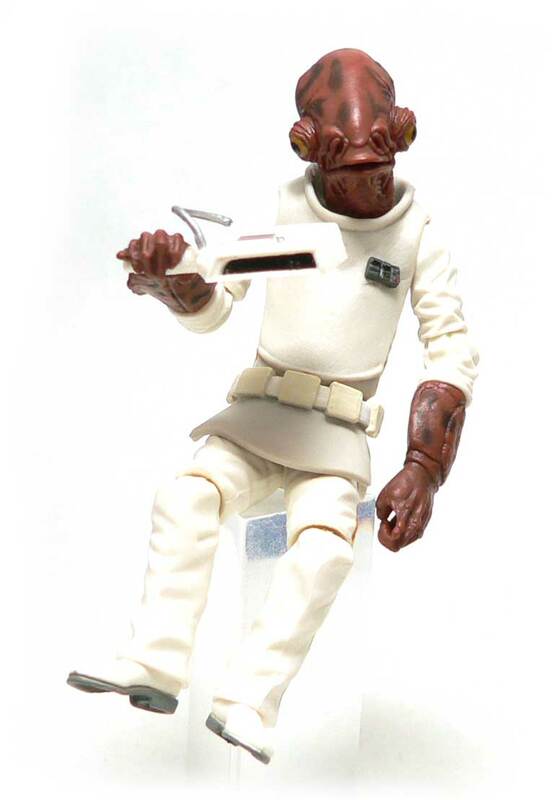 Would we really need a fully super articulated Admiral Ackbar? The elbows articulated and there’s a swivel joint in the arm just about the hand piece. I have to say this figure is a great example of practical articulation. The figure’s joints are downplayed in the sculpt and aren’t noticeable. Instead of putting in a wrist joint at the wrist, it’s back farther to hide it. Messy ankle joints? Not there. 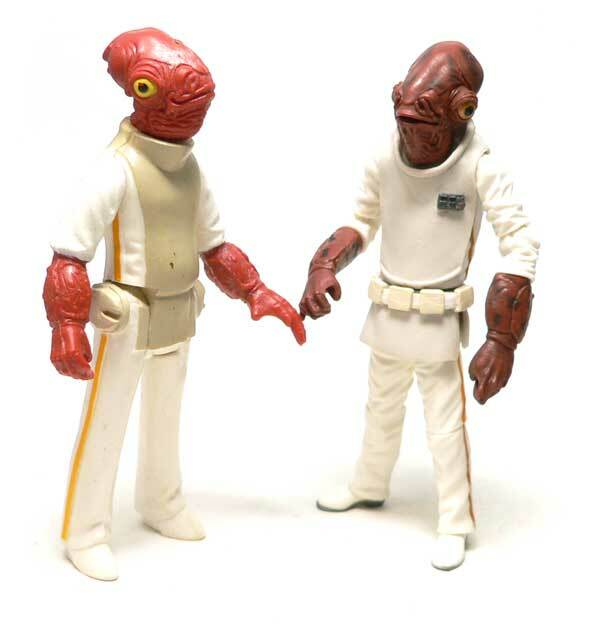 The ball jointed head is well camouflaged by the high collar, and gives Ackbar a number of expressions. Well, as expressive as bug eyed crustacean get. I do think they missed out on a good action feature here, though. A movable jaw. 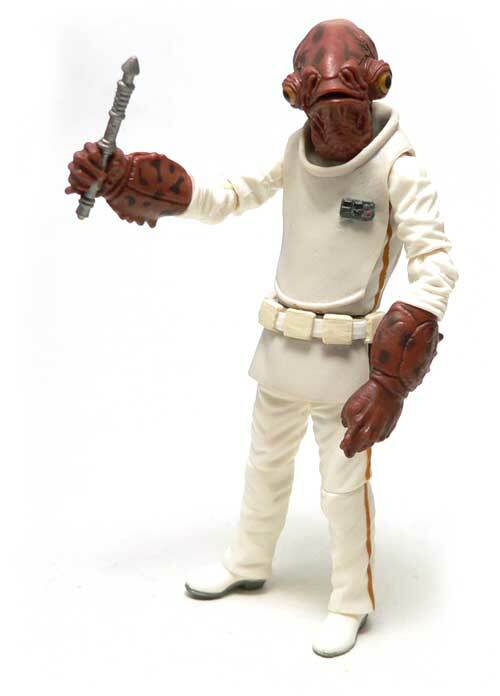 I’d have gladly given up a ball jointed head for an Ackbar with a lever on his back that operated his mouth. I have to say I’ve really been selective on my Star Wars figure buying. I was even a little hesitant to pick up the admiral. After all, he only has a few lines. There are no action scenes with him. All he really does is give Lando somebody to talk to during the Death Star battle so the audience knows what’s going on. That said, I’m really glad I picked up this update. Other than the gold on the eyes and the goofy accessory, I really can’t say anything on the down side for figure. He’s probably one of the best updates that I’ve seen to a vintage figure. Now, how did I write all that and not say, “It’s a trap!”? 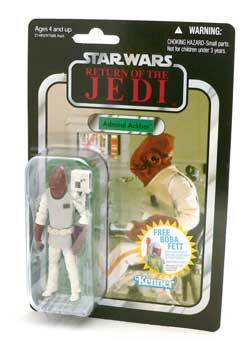 I remember getting Ackbar in the mail back in the early eighties before Jedi came out. I didn’t have a clue who he was so I lumped him in with my cantina aliens; after all, he looks like he fits better with them than with the Rebels. I don’t think I got him as a mail in. I got alot of those, but not him. Anakin and Boba are probably my two favorites. Awesome figure, and reading your review makes me want to pick one up as soon as I see him. Thanks. I have to say I was really pleased. I haven’t got many SW figs lately, so it was nice to get one that is great. He’ prominent in the battle of Endor. Which features lots of action.So this military genius has his orders countermanded by a scoundrel/ cloud city baron/known liar/General that is Lando Calrissian. Now, to my knowledge, only one thing in the SW canon can possibly make less sense. To wit: Wedge Antilles and Biggs Darklighter taking orders from a punk kid who never even transmitted his app to the Academy.